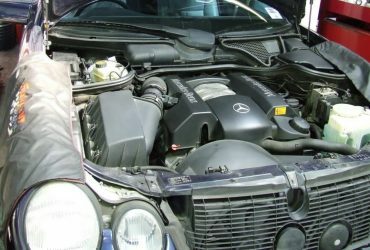 What does the term “Black Death” mean with regards to Mercedes vehicles? 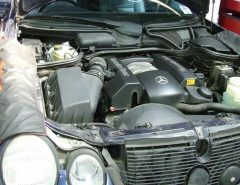 Due to poor design, the injector seals on Mercedes diesel engines can leak, which means uncombusted diesel and exhaust gases are pushed back past the injector seal and up the injector shaft. This all occurs during the compression and exhaust cycles of the engine. The result of this means the space between the rocker cover and the plastic lid can become infested with a coal like substance, which will get worse if left untreated. Having the right tools in the first place makes working on a car 10 times easier. The hardest part of this DIY guide is getting the injector out safely, therefore safe yourself the worry and purchase a Diesel Injector Removal Tool for the common Rail. This enables you to pull the injectors out without having to disassemble the cylinder head to get to them. Once you have carried out the job, the diesel injector seat needs to be cut back and cleaned before placing the copper seal back on. You can purchase a Universal Diesel Injector Cutter Set here and this will ensure the spot seat is as smooth as possible to reduce possible re-occurrence of injectors leaking. How to replace a CDI Injector with Black Death? The car that will be used as the example in this tutorial is a ML270 CDi, where most of the rules apply to the other CDi injectors. Firstly, remove the engine cover and determines which injector(s) are leaking. You should be able to hear the faulty injectors but if not, use some water or solvent on the rocker cover when the engine is running. With the engine cover off, remove the injector electrical plug and high pressure pipe. Next, clean all of the carbon from around the base of the injector and vacuum it all up. 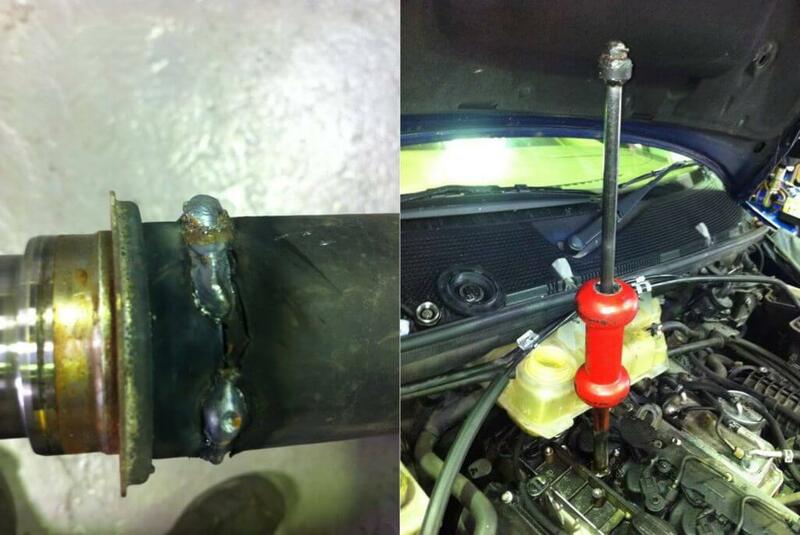 Undo the injector bolt (caution – they snap easy) and dig out the retaining clamp and vacuum any loose carbon. 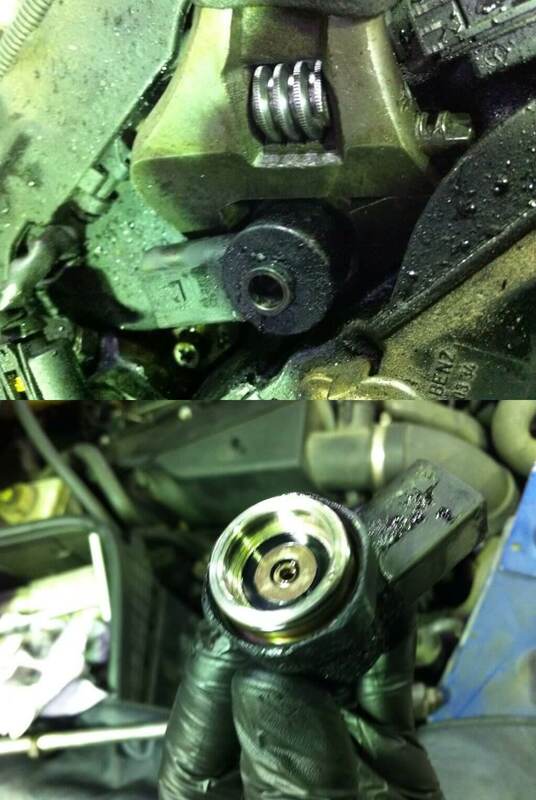 Some injectors may be loose enough to remove but others not. If stuck, you may need to use a special tool to remove it. To use a slide type of hammer tool, you will need to remove the injector top. An adjustable spanner seems to fit the nut much better. Undo it fully and take it off but be VERY CAREFUL not to loose the small spring and spacer that fits in the top! This picture shows the top removed and the spring and spacer in the centre. The spacer goes in first. It is very small. Keep it dirt free. Attach the slide hammer to the stuck injector. Make sure the nut is tight otherwise it will pull the threads to bits. Once tight, hammer the injector out! The tool use is a slide hammer with an old injector nut welded to the bottom of it. Once the injector is out, get it spotlessly clean, including the lowest face and pay attention to the condition of the face. 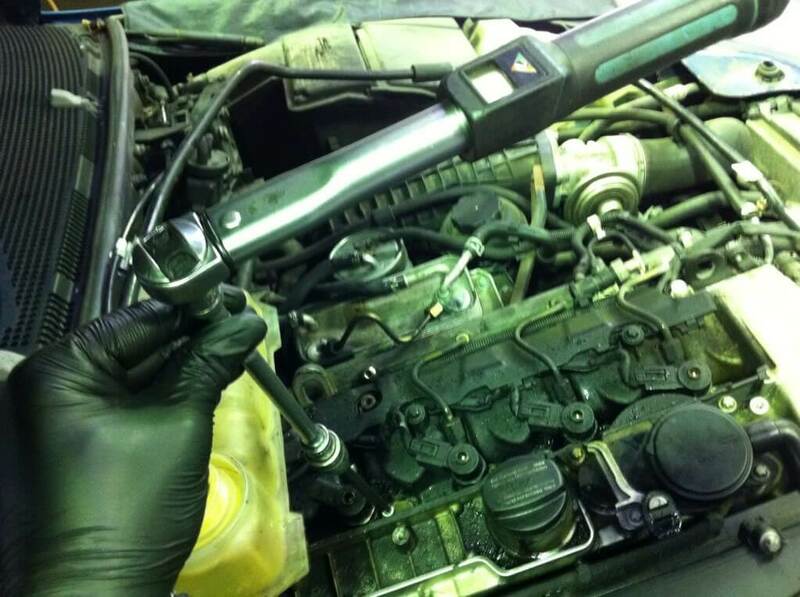 If there are any signs of wear, then its advised to replace the injector otherwise it WILL leak again! The next step is to vacuum down the injector hole and all around the general area. If you are lucky, the copper washer can come out with the injector but quite often its stuck at the bottom, where you can use a small long screwdriver and a hook to fish it out. Then the injector shaft in the head needs to be cleaned and there is a Mercedes tool kit for this that is excellent for this and the part number is 611 589 00 68 00. In the kit there is brass blocker to be inserted in the hole at the bottom of the injector hole to stop any debris entering the cylinder. When the injector hole is clean you then need to re-cut the face of it. Remove the brass insert before you do. The next thing to do is to clean up the bolt hole thread.. Use your fingers first to wind it in and out. Be very very careful not to go too far or snap it in the head. If you snap it the cylinder head will have to be removed. If you go too far you will penetrate the water jacket. Take your time and be patient. Get the thread clean as possible and remove all of the carbon that can clog it. If the threads are worn due to poor workmanship before use a helicoil to repair it. ALWAYS use a new bolt and copper seal. They are pennies from your local Mercedes Benz dealer. You need to make sure the injector retaining bolts goes deep enough to clamp enough. This is vital. Finally, you can put it all back together, remember to add a new washer on the end of the injector. Insert the injector in the hole, fit the clamp and bolt, and then torque the bolt up. The torque settings are for this engine (most CDI’s) is 7nm and TWO angles of 90degrees. The 7nm crushes the washer. The first 90 tensions the bolt, the second puts a slight bend in the bolt so its slightly springy. Fit back the electrical connector and HP pipe. Turn the engine over a few times. It may take a while to start. This is quite normal. 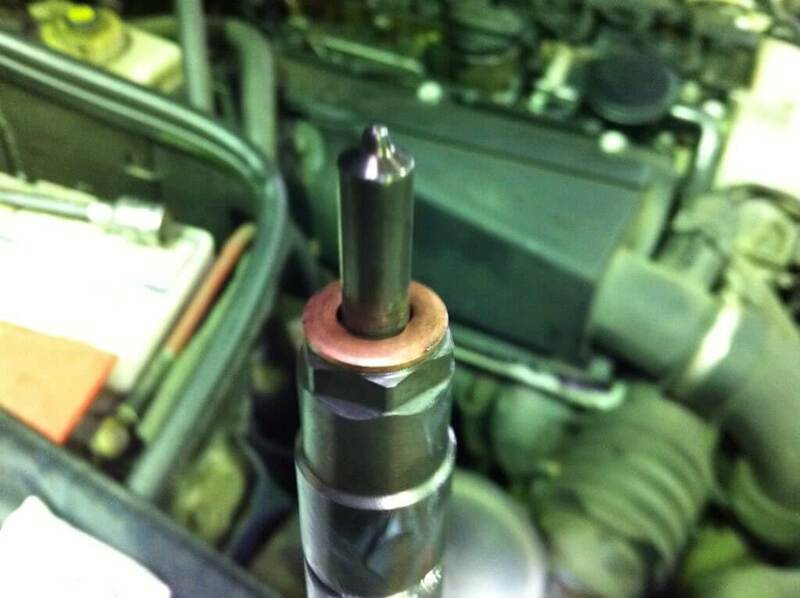 Sometimes the force used to remove the injector can damage it. If that is the case replace it. I know there are a few different methods to do this. Its whatever works for you. With the right tools it should only take an hour to do per injector. You must make sure you vacuum at every stage to avoid the carbon entering the cylinder or bolt hole. One tiny bit of carbon can bend a con-rod. This DIY Guide is for informational purposes and guidance only. We MercedesEnthusiasts.co.uk and individuals associated with the website through ownership and contribution will not accept any liability for any loss, damage, injury or negligence direct or indirect from use of the information / advice contained within this website. 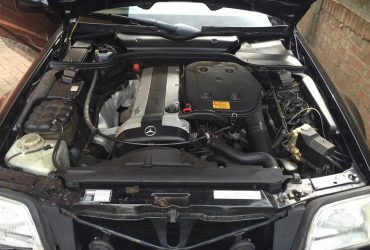 Many thanks to Olly at Prestige Car Service (Mercedes & Smart Specialist) for this excellent DIY Guide/Tutorial.